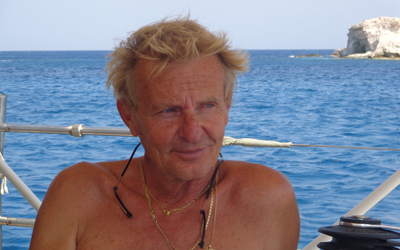 The crew is made up of Aldo (skipper and owner) and Gioia (co-skipper and hostess). Aldo has a long experience as a “sailor” both on racing and leisure yachts whereas Gioia has been sailing with him for 14 years. Aldo and Gioia have met in Venezuela, where Aldo had arrived from Rome on board of Ganesh, a wonderful 50-ft schooner. Together they sailed around the Caribbean Sea, with cruises along the coast and around the islands of Venezuela (Los Roques, Las Aves, Margarita, Tortuga, Blanquilla, Los Testigos), the Windwards (Trinidad, Tobago, Grenada, Cariacou, St. Vincent and the Grenadines, St. Lucia, Martinique, Dominica) Leewards (Guadalupa, St. Kitts and Nevis, St. Martin, St. Barth, Antigua and Barbuda, Anguilla) and the British Vergin Islands. 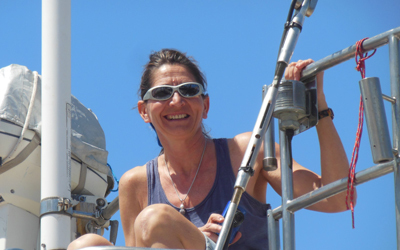 After the Atlantic crossing in may 2002, Aldo and Gioia have gone back to the Mediterranean Sea and have spent three seasons sailing along the Italian Coast and among its several Islands. In 2009 Aldo and Gioia bought My Song and after a season spent between Italy (Pontine Islands, Capri, Ischia, the Coast of Tuscany and Sardinia) and Spain (Balearic Islands, Ibiza and Formentera and Valencia), in May 2011 they set sails to Greece and found a home away from home for My Song at Leros, in the Dodecanese.